CLUVER -Indiae Orientalis et Insularum Antiqua et nova Descriptio. CLUVER, P. - Indiae Orientalis et Insularum Antiqua et nova Descriptio. Indiae Orientalis et Insularum Antiqua et nova Descriptio. - CLUVER, P.
Title : Indiae Orientalis et Insularum Antiqua et nova Descriptio.. 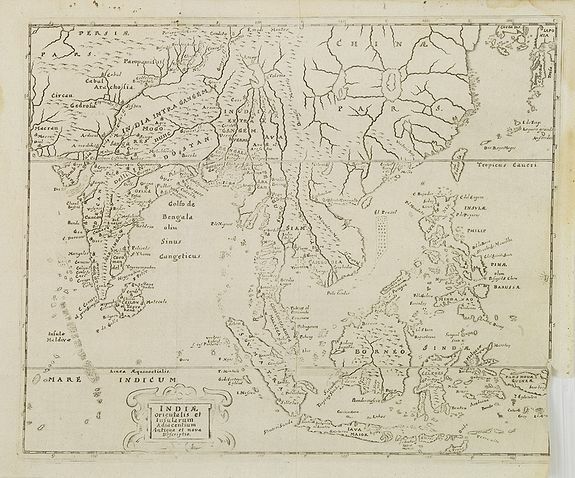 Description :Interesting map of South East Asia, including Indonesia, India, Taiwan from a German edition of Philipp Clüver's famous Introductionis in Universam geographicam, first published in Leiden in 1624. Philipp Clüver (1580-1623) was virtually the founder of historical geography. The map is copied of the Blaeu. Condition : With several horizontal and vertical folds, as issued. A somewhat weak impression.